A Green Pea galaxy is a compact galaxy with a strong oxygen emission line. Since this emission line gives the galaxy a greenish color, and its compactness makes it appear small and round, it looks somewhat like a pea, hence the name. They were first discovered in 2007 as part of the citizen science project Galaxy Zoo, where their distinctive look made them relativity easy to distinguish. 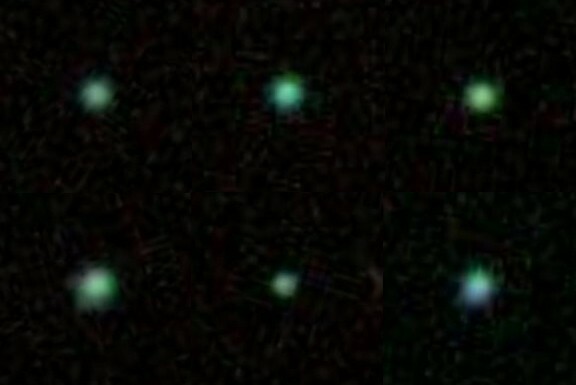 A group calling themselves the peas corps identified more than 100 of these dense galaxies. While the collection was treated with a bit of humor, it turns out that these pea galaxies may have played a role in the reionization of the early universe. Reionization is when starlight first began to illuminate the universe. About 380,000 years after big bang, the initial hydrogen and helium finally cooled enough that it became transparent. The light formed during the earliest moments of the big bang was then free to travel through the universe relatively unimpeded, and we now see that light as the cosmic microwave background. At that point, since the hydrogen and helium was no longer hot enough to produce light, but hadn’t yet collapsed into stars, the universe entered a period known as the dark ages, which lasted 400 – 500 million years. When stars and galaxies did start to form, the ultraviolet light produced by the large first stars re-ionized the gas between stars, creating the second light of the cosmos. Just when and how reionization occurred is still a matter of some debate. 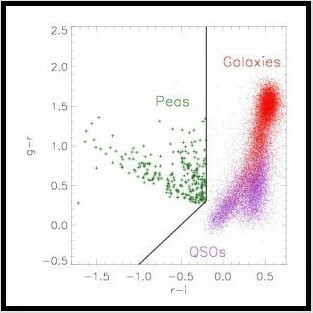 Green pea galaxies are distinctly different from other galaxies and quasars. A recent paper in the Astrophysical Journal argues that galaxies similar to green peas may have played an important role. It turns out that the bright oxygen glow that gives green pea galaxies their distinctive color is due to the fact that the surrounding interstellar medium is fairly diffuse. This is unusual for dense galaxies that have a high rate of star production, but it means that the light from new stars can penetrate deeper into interstellar space. As a result, more of the surrounding gas can be ionized. Besides their dense green visage, another distinctive feature of these galaxies is that there is no evidence of a central black hole. In the early universe, these kinds of galaxies would have been a source of intense ultraviolet radiation, and that radiation could have penetrated deep into the cosmos, which could have jumpstarted reionization after the cosmic dark ages. So perhaps what brought the universe out of the dark ages was simply giving peas a chance. What other new astronomical objects have the folks at GalaxyZoo have discovered? And, is there some Hubble images of how these Green Peas look like closer?